4) The goodness and kindness of Filipinos. Anthony Bourdain said recently that Filipinos are the nicest motherf’ers you’re ever going to meet. OK, maybe he didn’t use those exact words. But it’s close enough to what he actually did say. If you saw Anthony Bourdain’s Parts Unknown where he went to the Philippines, you’ll remember that he said, “Filipinos are, for reasons I have yet to figure out, probably the most giving of all people on the planet.” Most Filipinos would probably shy away from this compliment and dismiss it – even though we know it’s true. For the most part, I think Filipinos are inherently selfless and just love to share for the sheer enjoyment of making other people happy. And when it comes to food, the abundance of generosity is overwhelming. If you go to a Filipino family’s house for miryenda (snack), you will get the equivalent of a 5-course meal, where you will probably love every bite. And if you get invited to a Filipino party…bring the loosest clothing in your closet. Especially if you know lechon (a whole roasted pig) will be there. Typically, inside the thin, crispy wrapper is a mixture of ground pork, shrimp, garlic, onions, carrots, and water chestnuts. All so good, but I wanted to make a stripped down version that didn’t include shrimp, since my husband and sons aren’t big fans, and also to lessen the amount of ingredients to chop because I just wanted to make these babies and eat them STAT. I’m glad that Filipino food is gaining more exposure in magazines like Saveur and Fine Cooking, food blogs like Burnt Lumpia (http://burntlumpiablog.com/) and Junblog (http://blog.junbelen.com/) and in restaurants like Jeepney, a Filipino Gastropub, and Maharlika, both in New York City. And I’m jumping on the “Filipino food is amazing!” campaign trail too. To me, there is so much to love about Filipino food. Not only does it taste delicious, but you can feel all the love and kindness that goes into making the food. 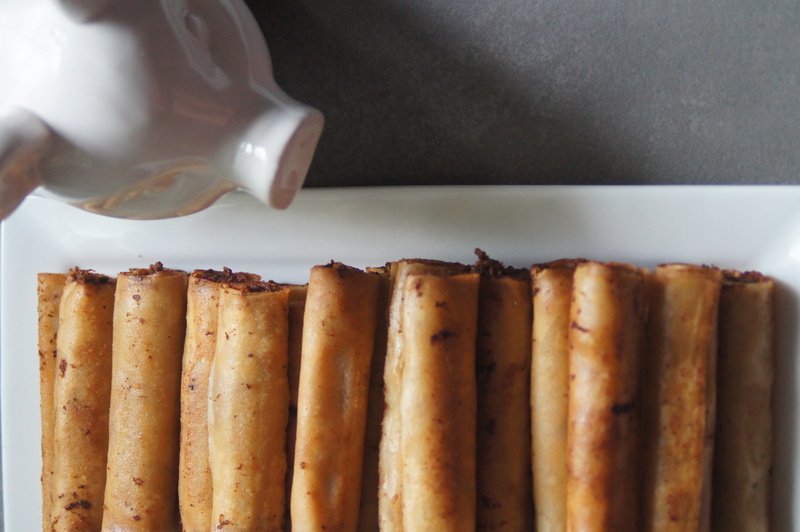 And I hope that you try this Lumpia Shanghai recipe and the other Filipino recipes I’ll be posting and see what I mean. You might even be like me and just break out singing. That’s OK. It’s a Filipino thing. Just let it happen. With a sharp knife, cut the square lumpia wrappers in half. You should have two stacks of rectangular wrappers. Place wrappers on a plate with a damp paper towel on top and set aside. In a large bowl, combine the ground pork, garlic, ginger, soy sauce, sesame oil, eggs, and black pepper. Mix the filling well with your hands so that all the ingredients are evenly incorporated. At this point you can pan fry a small piece to check the seasonings and see whether or not it needs more sesame oil, ginger, pepper, etc. Place a small bowl of water onto your work surface. On your work surface (such as a large cutting board) place the wrapper vertically so that the short edge is facing you. Put a heaping teaspoon of the filling on the wrapper, leaving about a half inch from the edge that is closest to you. Take the bottom edge of the wrapper that is facing you and roll up and over the filling. Stop rolling until about an inch of wrapper is left. Dip your fingers in the bowl of water to moisten the remaining inch and then finish rolling the lumpia. Place the lumpia, seam-side down, on a separate plate. Continue with remaining lumpia wrappers. When you have completed rolling all of the lumpia, fill a large frying pan with about 1/2-inch of grapeseed oil. Heat the oil over medium-high heat. 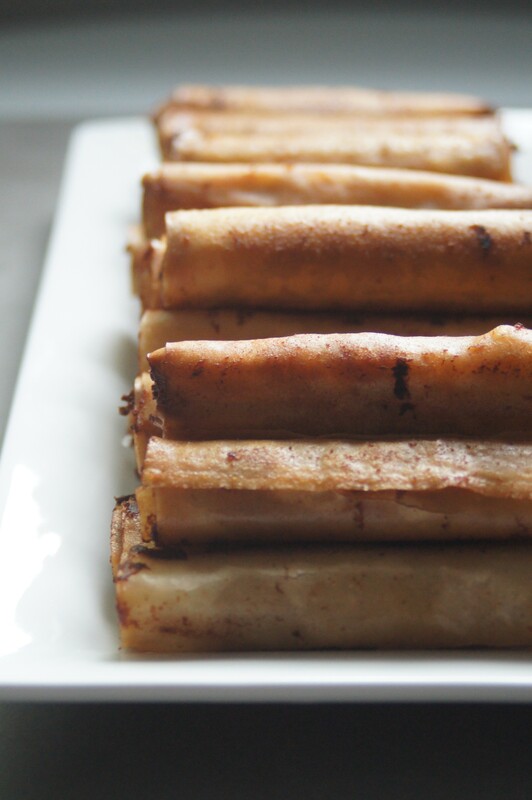 Place the lumpia gently into the hot oil and fry until golden brown on all sides, for a total of 3 to 5 minutes. Place the fried lumpia on paper towels to drain of excess oil. 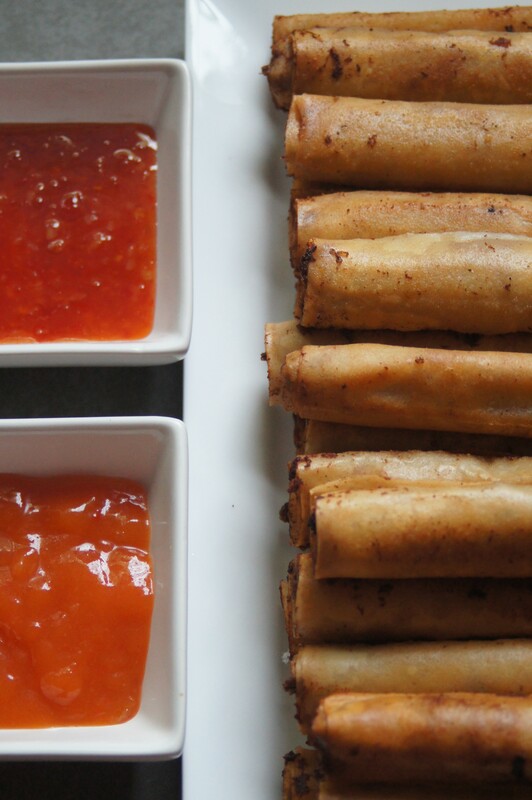 After the oil has drained move lumpia to a serving platter and serve immediately with dipping sauce of your choice. 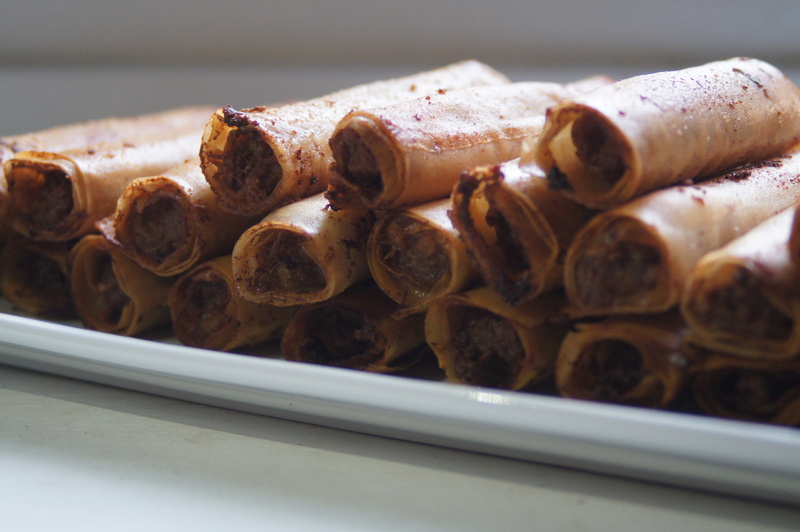 The lumpia can be assembled and frozen uncooked. Just place in a freezer bag. When you are ready to cook them allow 1 or 2 extra minutes for frying.